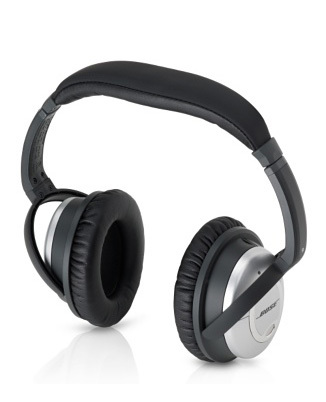 Bose QuietComfort 2 Acoustic Noise Cancelling Headphones combine the exceptional noise reduction technology of the original QuietComfort headphones with dramatically improved audio performance and enhanced convenience. Supports all iPod models. Experience the innovative combination of Bose's best noise reduction technology and best headphone audio performance with the QuietComfort® 2 Acoustic Noise Cancelling headphones. These premium headphones dramatically reduce unwanted noise, and advances in Bose® technology make what you want to hear sound even better. Their ergonomic design allows for a comfortable fit and the fold-flat feature makes storage of these lightweight headphones even easier. Use them at home, in the office, on airplane flights, trains and buses--anywhere you enjoy listening to music. Acclaimed noise reduction technology. Patented Bose noise reduction technology helps fade background distractions so you can enjoy more of your music. Improved audio performance. TriPort® (acoustic) headphone structure allows deeper, richer lows from a small headphone design. Proprietary Bose® technology produces a richness of audio performance remarkable for headphones this small. Comfortable fit. Their lightweight ergonomic design offers a fit so comfortable you may forget you're wearing them. Enhanced styling for added convenience. They fold flat for easy storage in the slim carrying case. A single detachable audio cable gives you easy access to portable MP3-CD-DVD players, home stereos, laptop computers and in-flight entertainment systems. Low battery life indicator with flashing light to give ample notification of remaining battery power, letting you know when remaining battery life is approximately five hours. One AAA battery affords 40 hours of normal use.